It's been a while since I have checked in to my musings to report on the goings on in my brain and heart. Sometimes we just need to be in the world, doing what we do. Doing. Working. Experiencing. Being. This past week was my first uninterrupted week of work since starting my sabbatical. I actually had time at home to do my work without being called away. What a luxury and what a challenge! The challenge of course is the magnitude of my projects and the awkwardness of moving between them, prioritizing them and following through with them. I have found that it takes me at least 1/2 hour just to get back into a project that has been inert, remember what I have done and figure out what I need to do next. Then of course comes the actual work of doing that next step in such a way that I am prepared for the following step. As I write this, it sounds incredibly dry and boring, and I am wondering why any one would ever keep reading this little post. But, I feel deep down there is a lesson here. . . somewhere. When we have vision, and we have great goals for change and growth, new information, and new processes, we need tools to follow through with them. It becomes more complicated when you're like me and have three or more huge projects in the works at one time. Switching between them mentally can be a huge effort. So, I have shifted my emphasis from what I am working on to what I am finishing. Finishing, doesn't mean I am completely done, but done enough to let that project sit for a while in a state that I can successfully pick up when it is time. In other words, as I am working on a project, I am also thinking about the trail of breadcrumbs I am leaving behind that will help be reengage with the work later. I ask myself, is this document complete enough to consider a draft (whether brainstorm, outline, first or second)? Is this somehow usable for the next step? Or have I just left behind I mountain of chaotic thoughts that might leave me feeling more overwhelmed when I return to it? Usability is key for me. I am incredibly talented at starting ideas, doing incredible brainstorming and then leaving it to sit and go nowhere. Now, as I am working on my sabbatical project I ask at each stage whether this dance score, or this chart, or this lesson plan can be used. Luckily, I am not a perfectionist so usability is something I can see at a variety of stages. Ultimately I want to create resources for myself so that I don't have to recreate the wheel every time. There is something satisfying about generating something that works. It's a bit like making your bed in the morning so it is ready for you to get in at night. Do the little bit of extra work that invites you back into the process so you can enter with joy and excitement. Which leads me to my final question. . .
Did I make my bed today? How do we know we grow? It was easy when all we had to do was stand with our backs against the kitchen wall where our mother or father would mark our height and date. But, what happens after you max out? In my case, at a hearty 5’11”! Years blend into each other, and we often find ourselves time and time again in what seems like the same place or the same situation over and over again. How can we know we have changed? Grown? Learned? Each year I attend the National Dance Educators Organization conference. I have presented each year for the past 6 or so years—or more. I can’t really remember! But, what I do know is that each year I process through the conference ritual and each year I can see how I have changed and if I have changed over the past 12 months. The conference becomes a marker for me, an opportunity to notice what is different in me and in my approach to what I do and to those around me. This year I find myself with a deep centeredness that I don’t recall in past years. Often the conference is such a whirlwind. The preparation leaves us wind blown like leaves as we are swept into the official fours days of meetings, sessions, classes and panels. Each day is packed full of events and there are always more people in attendance than one person could ever try to talk to. This year over 700! So, with such a large group in attendance and with countless opportunities for learning and conversing, it is tough to stay connected to oneself and avoid the hustle and bustle all around you. So many wonderful dance education minds come together to share their stories during these grand conferences, yet we must trust that we will get what we need from this massive event. It will come to us just as we need it. In the package we need and at the time and place in which we are ready to receive it. My goal is to let the conference come to me as it may. I want to soak in the experience without feeling flustered or overwhelmed as I have in the past. Most importantly I want to be fully present in the experiences and in the conversations. Personal growth means we get to revisit something familiar and do it “better.” We get to be more mindful of our words and our actions, more compassionate for others and more patient with ourselves. As we experience this we can feel ourselves growing, getting a little taller in spirit. What annual rituals do you practice and how do you approach them each year? Do you ever feel stuck in a rut or perhaps tired of running after new experiences? How do you measure your growth? The holidays of course are right around the corner and they are always a chance for practicing balance. What are your plans for growth and change? How tall do you hope to grow this year? My colleague and friend Jessica Kondrath and I are pooling our efforts for a show to happen this weekend at ARC in Pasadena. It all started when I commissioned Jessica to set a piece on my students at Moorpark College. 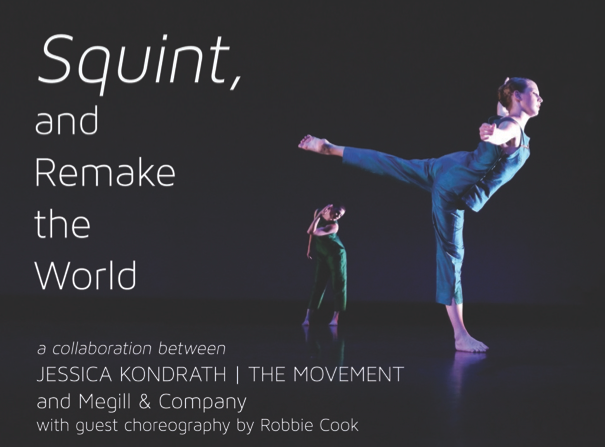 The piece, called Squint, and Remake the World was a great challenge for the young dancers who valiantly rose to the occasion and learned a lot in the process. But, there was something about the piece that made me want to dance it. And, not many pieces will do that for me. So, I asked Jessica to reset it on my company. . . and, well, collaborating on the one piece turned into the production of an entire evening of concert dance. Once this idea was planted in my mind I started to work on a choreographic response to Squint. I titled it Underneath Scattered Eyelashes. A version of the dance was performed on Megill & Company's Gala performance late May. I have never created a choreographic response to another dance, so this was a fun and interesting choreographic challenge. I enjoyed drawing from some of the motifs of Jessica's work and using them as a spring board into a new direction. Here is a little more about the nature of the piece and my thought process behind it. The title of the work comes from a little game I played when I was younger. When an eyelash fell on someone's cheek we would get hold of it have the person make a wish while blowing the eyelash (and the wish) into the air. Where are all those eyelashes? And, perhaps more importantly where are all of the wishes they represented? Additional imagery for the piece is drawn from the beauty and timelessness of celestial movement as the home of our dreams. The use of arm circles in the piece represents the rotation of the planets. The large sweeping circular pathways reflect the orbits of the planets around a star. These grand images of the galaxy are contrasted with a gritty reality that is our life on earth shown in the position of one hand on the head and the other on the hip. The piece ultimately asks an existential question about who we are in this world and in this lifetime. Some of the movements are based in CFR lessons (Cortico-Field Reeducation) that I have learned as part of a Feldenkrais-based physical therapy that reintegrates the nervous system for greater ease and efficiency. The paradoxical nature of the piece can be seen on a micro and a macro level in the design of the body in relationship to gravity and itself and the designs of the bodies in space in relationship to each other. The heaviness of the piece comes from the existential crisis we all face as some point in our lives. But, this is effectively balanced in the awe and beauty seen all around us. The meditative quality of the piece invites the audience to come inward, to settle their energy into this moment and to bask in the complex paradox that is this lifetime. In addition to Eyelashes, I will be performing a structured improvisation I created last year called Inside the Vault. This solo involves five audience volunteers who help me demonstrate the way our brains are able to make connections as we learn. The piece came to me in a flash. I heard the Tom Waits song; I thought of the text, and I saw the volunteers and use of the yarn all in one moment of artistic connection. This piece is about memory and memory loss. Our brains have millions of nerves that connect and reconnect as we learn things and forget things. As we age this process of connection can become difficult for many reasons. The song Young at Heart performed by tom Waits includes the lyrics "Fairy tales will come true, it can happen to you, when your young at heart." This reminds us to notice how old or young we feel. What dreams have we forgotten and what dream to we still hold onto. How do we interact with the world as emotional beings with our life experience affecting each decision at every turn? These type of questions are addressed in the spoken text from a book My Stroke of Insight by Jill Bolte Taylor in which she describes how our brain is structured and how the neurons connect to each other to create emotions that are the same at 10 as they are at 30 or even 77. We are both old and young at each stage in our lives. Our nervous system has no age, and yet we think of ourselves as aging, forgetting, and losing all that we are with the accumulation of years. If you come to the show, I would love to hear your thoughts on the work. I decided to write this blog in response to a friend's request to know more about the pieces in the performance. She finds the background knowledge provides a key to unlocking and appreciating the pieces on a deeper level. This got me to thinking about the dance world and audiences and the common misperception of "not getting modern dance." I offer this blog to those who are interested in knowing more, as a sort of alternative to a DVD commentary you might have on a favorite film. When we invest our attention into something, we are able to enjoy it on many levels from many perspectives. I hope this blog gives the audience members for this weekend's show a foothold into deeper appreciation. See the show? Share your thoughts as a comment below! Feedback is a precious gift! This summer I had a great time reading books-- and I thought it would be interesting to share. I hope you find the list useful! Some are fluff, some are transformative. All were rewarding in some way. Taking the time to read the book was step one, but also going back to look over my notes/ my highlighted sections proved to be a meaningful step in processing some of the more informative selections. I generally read on a kindle because I want to keep the books for reference but don't have an inch of spare space in my little cottage to expand a hard copy library. It works well for me. A good old fashioned murder mystery that takes place in England in a town where American soldiers had been stationed during World War II. I liked the depictions of that era in history and how they tied it into a murder mystery that was discovered decades later. This was the perfect antidote to the heavy thinking I was doing in Labanotation Teaching Certification course. Etched in Sand by Regina Calcaterra: This book broke my heart. It is the true story of a family of neglected children as they vied to stay alive and out of the foster system. Their mom would abandon them for weeks at a time and they had to learn to lie, steal and care for themselves. I of course have heard stories of neglect and abuse, but this book put it all into perspective, teaching me about the broken government social system, the scars that are left behind these tragic situations and the resilience of the human spirit. Abducted (a Lizzy Gardner series) by T.R. Ragan: Ok, I thought I was purchasing another book. So, I got it wrong. Anyway, I did read it. Total fluff. Not that well written, but, I still took the time to finish it, so it must have been giving me something (crude entertainment). If you need mindless and still mildly interesting, it could be a possibility. I hadn't ever read it before! And, I wanted to read it before I saw the recent film. Really a strange novella about pretty dysfunctional people. I liked it. Easily Amused by Karen McQuestion: Really quite terrible in my opinion. Super fluff. This was a rich and extremely informative book that is nevertheless easy to read and fun. It traces how our brains respond to beautiful things and artful things. My favorite lesson was in regards to our differentiated systems for liking something and wanting something (pleasure vs. desire). In the art world we can really mix up these responses, and it can get muddy as to why we like what we do. Do we like this jazz dance because we like the artful craft of the design or because we desire the young dancer? The book covers much more than this, and I am brimming with ideas about implications for dance as art and commodity. Sound of Waves by Yukio Mishima: this was a re-read. My college roommate had it and recommended it to me way back in the day. I did read it, but re-reading it proved to be like reading it for the first time. It is beautiful. Simple. Elegant. Romantic. There is a purity to the descriptions as it depicts a fascinating island culture in Japan in the 1950's and the love between two young islanders. I chose this book in part because of my sabbatical. How was I going to "do" or rather "not do" my year away from instruction? Autopilot builds a convincing argument for our need for downtime, relaxation, day dreaming and general unfocused time. The science behind our need for rest is fascinating and the implications for our quality of life is fascinating. If you have ever felt guilty for taking naps, staring off into space or sitting in your garden for extended period of time, you need to read this book. Seeds of Virtue, Seeds of Change edited by Eido Carney: (Anthology of lessons by 27 women in Zen Buddhism). Each chapter is a gift. So wonderful! And, my own Zen teacher Jane Schneider is one of the contributors! Thinking, Fast and Slow by Daniel Kahneman: about the difference between our intuitive and automatic decision making process and our deliberate logical (effortful) decision making. I'm just at the beginning of this one, but it is certainly promising. If you read a fantastic book this summer, please let me know in a comment below. Reading is one of my top priorities while on sabbatical this year. Note: I don't have cable or satellite. And, my internet connection is pretty slow living on the edge of town so Netflicks downloads are out of the question. My forms of entertainment are a bit limited in number. But, I wouldn't have it any other way! My husband Dan and I decided to get rid of cable over 3 years ago so we would have more time to read, take walks and be generally more active. I highly recommend it for anyone who feels they don't have the time to read. I am a hard worker. I always liked school. I enjoy investigating projects. I like finding solutions. I enjoy my work and I enjoy the people with whom I work.
. . . to other people. On day one of my sabbatical I actually set my alarm! Because I am using this year to learn how to be accountable to myself. I have dreams and visions of how I want to lead my life, interact with others and change the world (one dance at a time). I have always used my obligations to others as motivation for my work. And, this is not a bad thing. I have made great choices and accomplished a lot by living my life this way (See Blog post Healthy Obligations). What is new and wonderful (and scary) about this upcoming year is that I will have a chance to return to the childlike wonder I remember in my formative years. I am a product of Montessori schooling (for my k-5 years). I distinctly remember my classroom for grades 1-3 taught by Miss Susan Lindert. I loved learning. I was allowed to love learning. I was given the space to discover, imagine, and play. The Montessori classroom was based on the work cycle. I had my own list of tasks each day-- reading, cursive/writing, math, geography. I got to choose which to start with, and I was allowed to spent as much time on each of them as I needed, keeping in mind the goal of finishing all of the tasks. I always finished my work cycle with tons of time left over. And, it was at this point that I was set free to be anything, to learn anything, to play and discover. The Montessori classroom was covered in materials for discovery. Displays on Egypt, waterways, farm animals, musical bells, books, and books, and books, plants, languages, etc. And, I could do anything I wanted. I often got sucked into my Laura Ingalls Wilder books or would dream stories in my notebook. I remember wandering around the room and just looking at the possibilities. Looking back I see that the most important lesson was not the content I learned, but the sensation of free-form learning that I remember. I had hours each week in which I was only accountable to myself, my interests, my passions, my drives. I was never burdened with a feeling of "I have to. . . "
Waking up this morning, I felt transported to Miss Lindert's classroom again. Excited to learn, to do the work, to discover. These drives are part of my nature. They are real, and they are wonderful. I don't need to worry about being accountable to myself. I can trust my internal passion for discovery to move me forward. Interested in reading additional posts related to this topic? Click below. UCSB is my alma mater. I lived in and loved Isla Vista while I was there. Unfortunately, IV is not a stranger to tragic deaths. But, the recent mass murders shake me and my memory of youth, freedom and learning to the core. When I heard about the tragedy and read the transcript of Elliot Rodger's declaration of war against people, the first thing that I thought of was the insidious and pervasive isolation that our culture has created for itself. The mental illness behind this event and those like it is worsening as our culture continues to alienate and perpetuate instability, loneliness, and hate through a disconnected society. Obviously, I enjoy engaging in social media. I keep this blog among others, tweet regularly and post the usual pictures of pretty flowers from my garden to Instagram. Last month I gave a talk to dance educators about the need to get onto social media in order for dance education to catch up with the rest of the online world. But, I am first and foremost a dancer, a dance teacher and an artist. I love the performing arts in part because I love the community I feel when I engage in them. My private dance company is special because we are all friends - we love dancing with each other as people. Performing together is an act of community and reminds us of being human. Our increase in electronic connections have come at a huge cost to our physical connections. We have abandoned most of our outlets for heart-to-heart and hand-to-hand connection that comes with being physically together and interacting through movement and touch. The computer screen and the internet offer us a lot for the mind and even some for the spirit, but we are human and we need to feel embodied to feel real. And, movement and touch is our best means to finding that. I wonder if Elliot had more social dance in his life if he would have felt a stronger connection to others (especially women). Social dance classes teach so much more than steps. Have you seen Mad, Hot Ballroom? If you not, put it it on the top of your list today! Social dance classes teach us how to share the space with another person, how to respect them and yourself as you join together for a human experience: dance. We desperately need the arts, and we need opportunities for individuals to feel connected in a safe (non sexualized) environment. Going out to a club and jumping around in circle or grinding on someone is not clearly the same. It is not altogether bad, but it has a different appeal and is so unstructured (and usually intoxicated) that connections made are fleeting and confusing. If we lived in a culture where all people learned to dance together, we learn compassion for each other and our differences. I mean, there have been people in a social dance class who I have not preferred dancing with, but when the time came and we danced together, I inevitably learned something about myself and that person that I deeply value. Even if we weren't a great match for each other (temperaments, style, height - whatever) I had a chance to connect to feel that the other person is real, that they have a personality, complete with struggles and strengths. Dance has been used for millenia to remind people of their humanity. After the rock era we broke away from partner dance and formalized group dance as the common method of social dance. Perhaps the terror of isolation endemic to our culture could easily be lessened if we took hands, found the beat and moved together as equals - as one. If you teach social dance, please share your thoughts and experiences in a comment below. How have you seen social transform your students? Today is the first day of summer break. And, the first day of my year-long sabbatical. Let's Party! Today already I feel the pressure. How?!? But, what do I expect from myself during this time? . . and high expectations have been with me all of my life. Occasionally people mistake me for a perfectionist. I'm not. . . anyone who has seen my house or seen me in rehearsal knows that I enjoy improvisation more than controlled perfection. But, I do have high expectations for myself. I have worked hard and achieved great things including a solid job (which has granted me a year long sabbatical), a national presence amongst dance educators and a rewarding marriage and home life. But, these self induced expectations follow me. Today was my first official day of summer and my mind was reeling with the question "What should I do?" "What do I need to do?" and then I rested on "What do I want to do?" This next year (essentially 16 months including both summers) will bring things I can't imagine. And, while I have some structure in place (with my notation project), I am not exactly sure what this year will bring. Of course, the lesson is that we can never know. We encounter life moment by moment and expectations often get us in trouble because they so often closely align with assumptions. I don't want to live this next year according to my expectations. My expectations are a burden that I no longer want to carry. Instead I am ready to look toward intention. Yeah, it's a somewhat corny (and über-trendy) way of talking about life. But, living according to an intention is the only way to live without becoming attached to an outcome. When we live by expectation we are bound to either exceed, meet or fall short of them. But, when we live by intention we are bound to discover the unknown as it unfolds in front of us and better enjoy ourselves along the way. This year will bring the unexpected. But, I intent to take advantage of all that comes my way. How do you intend to spend your summer? Your year? Your life? The Rib Cage. . . Cage? Really? How do you think about your ribs? Are they one unit? Are they a block that gets moved as one? Because. . .that is pretty much how I have been using mine for a long, long time. Of course I knew that there were 12 thoracic vertebra (from anatomy classes and massage school), and each thoracic vertebra connects to a rib on each side. Duh! And, yet, I never really thought that these bones could work independently of each other. They always seemed so locked together. I couldn't envision it, let alone feel it. I mean it is a rib "cage"right? Not a . . .
. . . a rib accordion?!? I am just now learning to feel the motion that exists in the many areas and dimensions of my ribs, spine and sternum. I am starting to feel that my sternum moves my thoracic spine and vice verse. And, I can twist in those upper ribs! Each space between each rib has the capacity to move (even if just a little) to allow for generous twists that aren't just in my neck and low back. Yahoo! But, here is the rub, why did I freeze it in the first place? What was I caging between my ribs? Of course, the anatomical answer is the lungs. But, the more holistic answer is my breath. I was caging my breath, locking it between my frozen ribs. Why? Because that was an easy way to hide the muck of my emotions. In yoga they talk about prana or energy that is directly related to the breath. Yogis devote their lifetimes to controlling their prana through breath exercises. It is worthwhile practice for this very reason. Our breath is a direct link to our nervous system. And, the stuff that gets caught. . . I call it emotional waste. When my nervous system clicks into fight or flight, I have started to notice that I lock down my chest. It's a little like an emotional lock down that functions to keep me clear headed, intellectual and problem solving-- you know a "mature adult." But, the reality is that inside I am having a tantrum! I am scared, angry, frustrated, hurt, sad. . . And, all of that is getting packed away into the rib cage. Day by day. Event by event. Challenge by challenge. When I don't let myself feel the intensity of what I am experiencing, I am just stuffing it away. Packing cement between my ribs in hopes of keeping the emotions at bay. So, now I get to relearn that reaction. I am discovering the movement of my ribs. But, I am having to deal with a lot more than rusty muscles. I am having to rediscover what triggers my nervous system into fight or flight which causes me to hold my breath and to lock down my heart center. Sometimes, it is a clear one to one explanation. Someone criticizes me and I react defensively. Or, I forget something on my schedule that was important to me and I freak out. But, sometimes it is less clear. I start to move my upper ribs with my breath, and I all of a sudden feel sad, or irritable, or angry. Those pent up experiences are held in the cellular memory of those tissues and the nervous system. This is big. Making change in this way requires constant vigilance as well as compassion and forgiveness. I can't just make a decision and force my ribs to move. I am undoing years and years of this reactive habit. And, forcing myself to do anything will just trigger my fight or flight again, defeating the purpose! No, this is a gradual process. A slow unfolding of the layers of holding. Bit by bit. I often fall prey to comparison. And, not in a healthy way. Because I do many different things, my time is divided. Because, of the split focus, I often feel I should go deeper into each aspect of my work. I often wish I could/would spend more time on my choreography, on my lesson plans, on my writing, on my advocacy. So, when I see others who devote themselves entirely to one thing with great success, I feel like my attempts are somewhat pathetic in comparison. But, that is changing, slowly. And, it is changing because I am realizing how others do the same thing with me. In a recent blog I wrote about the student who asked how I manage to have so much energy. I explained to her that I don't! The same week in a CFR class a fellow classmate described her impression of me being totally relaxed and comfortable, when in fact I was hugely uncomfortable and working really hard at the time. I am beginning to understand that others are elevating me in the same way that I have often elevated others. And, I won't stand for it! This misperception leads to too much suffering! It seems most everyone imagines that everyone else is happier, healthier, more balanced, more relaxed, smarter, more talented, more creative, blah, blah blah. We can't ever know someone else's experience. And, even if we did. It ultimately doesn't matter, because we only live in this body, in this experience, in this time and place. And, if we let it, we can feel the richness of our lives, full and vibrant in every moment (including the crummy ones). Full is full. And, we are full just as we are. In this moment, doing whatever it is we are doing, we are full if we are fully present. Our experience can't exist on a good or bad continuum, because that devalues our whole self, which is forever rich and complex. If we can truly let go of our desire to know what is outside of ourselves and instead become fully occupied with what is inside of us, we have a chance at dissolving the illusions that cause us suffering. We don't have to believe that there is always a "better" way. What if there was just "this" way? Then when we are tired, we are just tired. We don't have to try to be like that energetic person we see beside us. Then, when we are struggling we are just struggling. We don't have to wonder how that person can always smile all the time. And, when we own our experiences fully then we get to experience the sweet moments just as fully. When we are joyful, we are free to be joyful. When we relaxed, we are free to be relaxed. There is no illusion of the other being better. Because there is no other than our current experience. The present moment is all that will ever be real. The present moment is both fleeting and eternal. The rest is smoke and mirrors. What just has to go? Today was a big day. And, an unexpected day. I love to garden. I like the sensation of having my hands in the dirt. I enjoy pruning and replanting. Today my "gardening" consisted of an unexpectedly satisfying task - sycamore leaf removal. I live under a huge sycamore tree. Thriving in the wilderness of Brandeis, this tree is formidable, despite the continual pruning we do and the occasional branch break due to high winds and rain. It is glorious and makes excellent shade come summer time, but it drops massive amounts of leaves. Huge leaves. Everywhere. All year long. The endless summer of southern California means endless leaf fall. And, being the less-than-diligent yard worker that I am (I said I loved gardening, not that I did it often), these leaves get wind swept into every crevice and corner of the garden around my house. The leaves don't just sit on the ground, they manage to embed themselves in the other plants in such a way that you can only remove them by hand. So, while having my morning cup of tea. I for some reason decided today was the day. I swigged the last of my tea and got to work. Sweeping up leaves, pulling them out of the crevices, unloosing them from the grip of the jasmine vines. Leaves leaves leaves. And, what I noticed was that my garden is quite nice. There are some sweet plants that are very charming, even a few volunteers that were blossoming in the spring weather. I discovered that I had a nice garden all along, I just needed to unmask it. The leaves were suffocating the beauty that always existed underneath. The metaphor slapped by in the face. The idea that we have all that we need right here in front of us, and yet we can't always see it because it is being muddled up with the excess surrounding it. I am in a place where I don't need to plant more, I need to care for what I have, nurture what is already growing and give it the time, attention and space it needs to blossom. As I raked the ground and pulled out the lodged leaves, I found beauty all around me. There was such satisfaction in this process that my one hour stint turned into three glorious hours of unveiling the potential around me. And, with each sycamore leaf the reality of this process became more and more profound as a metaphor in all aspects of my life. This was confirmed later in a discussion I was having with two students about their choreography. I asked them what have you put in your piece that is diluting the power and beauty in your choreographic vision? What movements are just sycamore leaves clogging up the garden and disrupting the beauty that is already there? I knew it before, but now I feel the gravity of this idea in my core. I now want to go back and ask the same question of each and every one of my previous dance pieces. But, the most profound effect might be in my everyday life. How am I cluttering up my vision? What is diluting my essence? What is added on in such a way that it is covering up the beauty/core/root of what I want? How are things suffocating me and keeping me from being my clearest self? Simple and clear. Keeping what is vital and growing. Discarding the excess, the weight of last season's commitments. I am at a place right now where I am redefining what is enough and how I know I have enough/am enough. In the case of my garden, I had life at my finger tips, but I just couldn't appreciate it with it being visually swallowed up by dry, dead leaves. I am ready to take the time I need to give to the things that are already growing in my life. The things that are beautiful but can be easily forgotten when piled high with the excess surrounding me. It may not be an easy process. It might be as tedious as picking the leaves up by hand. But, I can see now that this is the next step for me. Clearing out. Revealing lush beauty all around me. I have often been surprised by my need for rest. Most people who know me know that I nap most everyday, and, only with exceptions (and often an extra bit of caffeine and adrenaline), do I get through my day without a rest period-- if not a whole 90 minute sleep cycle. It seems not everyone "needs" this rest in the same way. At least, many people I know express that a nap would be nice, but never actually take a nap. This is interesting because I nap in response to an intense need to reset all of my systems. When I am fatigued I feel absolutely crummy and my productivity is hopeless. If I have to, I can generate enough stress induced adrenaline to get through a day of go go go, but that comes at a cost to my health and energy level the next day. I have had a tough month with sickness. First a stomach bug then an upper respiratory infection. Basically, I was sick for about 4 weeks straight. And, I felt like I couldn't get better. I would try to take an extra rest here and there. Extra hour of a nap. Getting to bed early. Sleeping in. But, I was still ill and my productivity was shot. I felt useless. Enough was enough, so I spent two days in bed. Not because I had a fever of 102, but because I couldn't kick the fatigue bit my bit. I needed a huge rest or, rather, a huge reset. So, despite my intellectual desire to get work done, I could do none of it. During this time, I felt like I would never feel better again. I felt like I had never been productive or never had enough energy to get through teaching a dance class. I was consumed by the present experience of being ill and completely spent. And yet, after those two days of pure rest (relief from a standing expectation to produce), I started to feel better. First 70%, then 85% and now I feel at about 95% which is such a relief! The little nagging cough is nothing compared to the overall incapacity I had experienced. And, these past two days I have been hugely productive. Catching up on a pile of paperwork that had been looming on my to do list for over a month! It felt to so good to sent off that email, follow up on that phone call, clean up that mess, file those papers. Oh, the joys of feeling the power of productivity! But, in reflecting on this past week, having felt so ill just 7 days earlier and only having felt marginally better 3 days ago, I am taking this moment to notice and observe that there is an ebb and flow to the way I do things. And, that is ok. Not everyday will feel as productive as the past two have, so I must remember during those dreary sick days that I will recover, that I will heal and return to the high point -- and that high point will eventually turn downward again. I will always be changing, and I want to remember the nature of the natural rising and falling at each stage in the ebb and flow. It is impossible to be hyper productive 24/7 for 365 days a year. I know this intellectually, yet I was still holding myself to a ridiculous standard of high output each and everyday. Perhaps as I become more honest and self accepting of my rhythms (as different as they seem from the people around me) the amount of energy I will increase. But, in the meantime, I am learning that I get to rest. That I get to change my pace as life comes at me. For those audience members interested in the “back story” to Megill & Company’s latest show, Dance Adventures in Stripes and Dots, this one is for you. When I started creating this work, I knew I didn’t want a narrative, but I knew I wanted a theme. I wanted to create a world that was fanciful, colorful, exiting and quirky. I don’t remember exactly when I hit on the idea of stripes and dots, but it was long before I created the first dance phrases for Dance Adventures. I have no other great explanation for the dots and stripes except that I like them. I like wearing them, I like seeing them, I like mixing them in my outfits. So, this world of dots and stripes developed out of that love. I then picked songs that I made me want to dance- to groove, to play. I picked songs I felt encapsulated the timelessness and playfulness that I associate with dots and stripes. From there I started making the dances, phrase by phrase week by week. Usually I create 1-2 minutes of choreography each week. Each week I picked a song from my list and experimented with movement. The music evokes a quality that I associate with an emotion or a character, and I do my best to bring that to life. For instance, the Amy Winehouse trio called Every Town’s Got a Hot Mess was directly inspired by the musical qualities of that song. While I don’t choreograph to lyrics, the sentiment of the song comes through because of the quality of the jazz rhythms, instrumentation and vocals. In this case, the piece is about three jaded cougars who live in DotsTown and are tired of the “scene.” I drew out the components of apathy and boredom in Winehouse’s vocals, and paired it with contemporary dance vocabulary and sultry jazz qualities. On the other hand, I also created some of the work from concept. Inside the Vault is a structured, improvisational solo that I perform to a combination of Tom Wait’s “When You’re Young at Heart” and Text from the book My Stroke of Insight as well as stream of consciousness text of my own. The concept of this piece came to me in a flash. The idea of being young and growing old, of cognitive processing, and making memories, of forgetting events, words, ideas, and names, and yet always feeling the emotions of life. This piece is about dementia and the reality of our nervous systems being both tremendous and fragile. First Step Again is a solo performed by Karissa Smith, and is a great example of a piece that started with concept and grew into its own over time. Set to another Tom Waits song “Walk Away,” this solo was always about the challenge of breaking habits. I choreographed 85% of the dance before I realized that the 2:30 minute song wasn’t what the solo needed. The story of breaking habits is not a short one, but a tedious and often painful one. In the music Waits sing of walking away to “start all over again.” And, that inspired me to make a play on words, that breaking habits often forces us to start all over again, even if we don’t want to. Thus, I broke up the choreography into chunks, having Smith repeatedly perform the material with varied intensities and emotional content and the two minutes and thirty seconds piece became a six minutes and thirty seconds piece in the course of an hour rehearsal. The group piece Tequila and Chocolate, set to Regina Carter’s Jazz violin performance in "Mojito," is a more abstract dance work, based purely on the joy of moving. This piece is not about story as much as it is about the craft and design of the composition. The Latin rhythms provided a fertile ground for me to play with syncopation and accents and each phrase became a nugget of complex rhythm that demanded hours of rehearsal and cleaning. The joy of this piece lies in the company members’ joy in dancing together. We love to make visual rhythms with our dance and there is nothing better than coming together on stage with a group of your best friends to dance together. The goal of Megill & Company is two-fold. First, we dance because we believe the joy of dance can be found in the pursuit of high quality dance composition rooted in rhythm and character. Second, we dance because we love it, and we love sharing our joy with others. To all our MeCo fans, old and new, thank you for your support! I was recently reminded of the fallacy of the statement "I didn't have time." In fact, every time we hear ourselves of other say "Sorry, I didn't have time" we can reflect that what we really mean to say is that "I didn't prioritize it." This of course is a less gracious and socially acceptable response, but it is closer to the truth. We all have the same amount of time in the day, and what we decide to do is ultimately our choice. Of course, we have "obligations" but every obligation is a choice as well. In an extreme example we might say "I can't abandon my child!" Well, you could. And, people have. But, you choose not to. Which means that ultimately that child is a priority in your life. And, a beautiful priority at that. Likewise, "Well, I have to work." There are those in our society that have chosen not to work regularly and live a non-coventional life as a result. These are all possibilities for how we can lead our lives. If they are undesirable, then we get to own up to it and accept that we choose what we do in out lives. We are not as victimized as we may feel at times. I reminded my students this week that this power of choice is with them all the time. I reminded that they could stand up and leave the classroom at any moment. Nothing was chaining them there. They are free individuals. They are not a victim of taking an 8am class. It was their choice. And, by owning that choice and the decision behind it reminds us why we made the choice in the first place. We prioritize our lives according the people, things, and ideals we value. My CFR practitioner says "The life you have is the life you want." Meaning that all of our choices have lead to this point and the values we hold. This doesn't mean you can simply choose a life without hardships. Sometimes the choices we are make are between the lesser of two challenges. But, the fact we even get to make that choice is a huge positive. Rather than get overwhelmed by the big picture, I think about the little daily things that shape my existence. For instance: Yesterday was a long day for me. A non-stop schedule from 8am to 10pm. It was a full day it was a tiring day, but it was a valuable day and worth the energy I chose to expend. I chose to have a full day that day knowing that today I have sometime to rest and recuperate. I chose to drink an afternoon coffee knowing that my priority on this particular day was getting through all of the events as alert as possible. Today, I won't have an extra coffee, because today I chose to rest and allow my body to process yesterday's choices. Perhaps the hardest part of making choices is owning our value set. When I choose to watch television over doing homework, I can feel embarrassed or ashamed of my choice. This is because I tend to over-value what people think about me, and I tend to under-value my need for rest. On the other hand, I can turn myself around and ask. What do I really want to do? Do I want to rest and veg out? Or do I want to do my homework and feel more prepared and confident going into my tomorrow? Sometimes the tv wins out, but when I stop and ask myself this question it can also motivate me to turn off the tv and open up my work. It feels good to do what we want to do. And, we feel it acutely when we resent having to do something we don't want to do. But, when we remember that we really don't have to do any of it. It can shape our perspective and our approach. I can wear dirty clothes for a week if I really didn't want to do laundry. But, I prefer to wear clean clothes. So, the laundry then becomes a treat. I GET to wear clean clothes! I get to be prepared for my day tomorrow! I get to make the choices that best serve me today! The concept of course is so simple. But, for me to consistently practice my power to choose has been huge in increasing my quality of life. Life feels more like a treat than a punishment. And, all I have to do is own the choice in this moment. Right where I am. Own it. Are you owning your power to choose? Where in your life do you feel obligated? When might you feel resentful? What choices brought you right here to this moment? Are they serving you? Happy New Year! The dancing poetess is back. And, this year I have set a strong intention of OWNERSHIP. The idea of owning and ownership first came up last fall in my CFR work. In this case, I was so frustrated with a part of my body that I had essentially disowned it completely. Ignoring it in a vain hope that it would somehow go away to fix itself. Of course, it just doesn't work that way. And so the questions arose: What does it mean to own something? What does an owner do? First, when you own a pet you must care for it regularly. You must feed it as needed and clean up after it on a daily basis. You must care for it at all costs under all circumstances, even when you are mad, even when you are tired, even when you are out of town. In return, you get to love it and it loves you back. You receive the joy of interacting with it and all of its quirks and personalities. But, when a pet is ill it can be heartbreaking, therefore, we must also be prepared to care for it during these special times, giving it extra time, attention and love. Also, we must realize that our actions directly reflect the life of this being. For instance if we overfeed our dog or cat, it is our responsibility to change the diet. For its health and longevity. Excess only makes it harder to properly care for something we own. So, now I am looking at the things I own in my life both physical and energetic/emotional. Both came into practice when I decided to clean out my jewelry drawer. I love jewelry (mostly funky, hippie stuff, cheap and of little value). But, having so much of it was making it hard to appreciate what I owned. Much of it has gone unworn for years. I had too much to properly care for what I had. So I started giving and throwing things away as needed. In this process I had to own my decision making for what was worth keeping and what needed to be giving away (even if I never wore it!). For more on my erroneous thinking behind saving things, read my blog Save the Blue Sweater. I moved onto my other drawers and then I hit the gold mine of excess-- the sock drawer. Or rather, the sock drawer and nearby basket full of various socks. Immediately my mind went to the justification. I am a dancer. We often dance in socks and need a lot of them. Plus, they get really dirty on the dance floor, and I need to keep some that are designated dance floor socks, right? Some socks have just the right texture for a marley dance floor, while others don't work at all, but are great with boots or other shoes. I need all of these socks. Unless they have a hole, I can't give them away or throw them away. But, of course, the reality is that I don't need all of these socks. And, while I can't go back and un-wear them or un-buy them. I can throw out the old ones and make more space for what I do have. I went through this process with much of my small house. My husband Dan helped support me and also gave away much of his old or simply unused things. We made space and through the process really owned the things we wanted in our lives. While, the house purging was fantastic, the real value of this practice was in the process of practicing my sense of ownership. I had to own every decision I made about the things I want in my life. I was exercising the muscle of ownership and conscious dis-ownership. By practicing ownership I was practicing my personal power. I was owning my personal power. Even in this small way, for me it was a huge step. It was a metaphor for they way I have been ignoring other aspects of my life and not owning them. Now, I see much more clearly how I want to honor chosen aspects of my life and my person with my time, attention and care. And, how, more will only make it more difficult to do so. What exists in your life that you might not be owning right now? Do you own your body? your time? your things? your decisions? your power? Are you giving the care-taking energy these thing deserve?